With the new games requiring higher standards of hardware, the ever devoted gamer is again left in search of a good graphics card that will not rip a hole in their wallets. Ultimately, the choice boils down to either nVidia or ATI. Each company has their own advantages. While the nVidia's cards sometimes crunch out better performance in terms of frames per second without AA, ATI has a more feasible consumer interest in mind. ATI tries to focus more creating a great graphics card without adding huge costs in the process, making their cards a better value. Their latest high performance graphics card, Radeon HD 4870 from Palit also introduced new and improved GDDR 5 graphics memory featuring up to 3.6 Gb/s bandwidth. Will this card be the ultimate card for the price for you? If it is, the saying that 2 is better than 1 may be generally true, but will it be in this case? Read on to find your answers, the results might surprise you. Radeon™ HD 4870 equipped with GDDR5 industry lead memory, deliver a cinematic gaming experience with unprecedented performance. The latest ATI PowerPlay™ technology helps to deliver the power needed to blaze through even the most intense games and to conserve the energy when the demand is low. 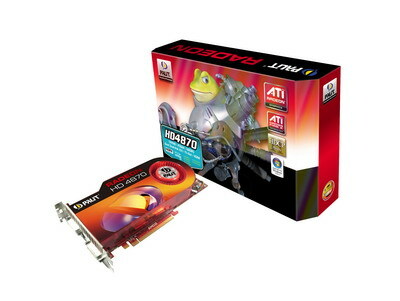 Moreover, with improved visual fidelity afforded by ATI Avivo™ HD technology, Radeon™ HD 4870 delivers an exciting high-definition multimedia experience on the PC allowing consumers to watch the latest HD DVD™ and Blu-ray™ discs with incredibly fine image quality and smooth playback.